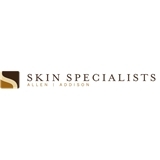 Skin Specialists (Allen) - Book Appointment Online! The mission of Skin Specialists of Allen/Addison is to provide quality health care services that meet the needs and values of our patients. We treat each patient with respect and compassion.